When OMEGA created the first Speedmaster in 1957, no one could have imagined what adventures lay in store for the watch that would become the world’s most famous chronograph. The new Speedmaster Broad Arrow Co-Axial collection introduces some stylish additions to the classic design of the watch that has been part of more than a hundred NASA missions including all six lunar landings. The dial, available in black or silver, features a distinctive “Geneva Waves” pattern. The familiar chronograph counters, or sub-dials, are characterized by three applied rings which surround a unique “beehive” structure, giving the Speedmaster Broad Arrow Co-Axial its own personality. The sub-dial rings on the silver dial are blackened and those on the black dial are silver for a particularly appealing contrast. There is a date window at the 4:30 position on the dial. The hour and minute hands, which are either blackened or rhodium-plated, are coated with white Super-LumiNova which makes them easy to read in all lighting conditions. The central chronograph hand has a red tip as do the hands of the sub-dials. The 44.25 mm stainless steel case has the shape which has been associated with OMEGA Speedmasters for more than half a century. The Speedmaster Broad Arrow Co-Axial is presented with either a stainless steel bracelet or an integrated black alligator strap. 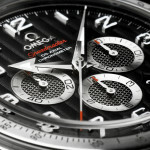 The Speedmaster Broad Arrow Co-Axial is powered by the exclusive OMEGA Co-Axial calibre 3313. 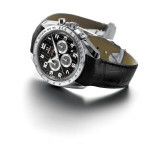 The accuracy of the self-winding chronograph is independently confirmed by its status as a COSC-certified chronometer. The movement is equipped with OMEGA’s Co-Axial escapement on three levels. It delivers outstanding chronometric performance over a long period of time which increases service intervals and has allowed OMEGA to guarantee it for three years. It also allows the possibility of changing the hour hand independently of the minute and second hands – ideal for travelling between time zones. The movement is visible through the sapphire crystal case back. The outstanding chronograph performance of the Broad Arrow Co-Axial is ensured by its column wheel chronograph mechanism. 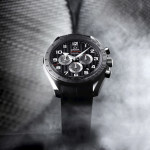 The watch is water resistant to 100 metres / 10 bar / 330 feet. The OMEGA Speedmaster Broad Arrow Co-Axial watch is a fashionable interpretation of a chronograph which has gone to places no other watch has ever been. 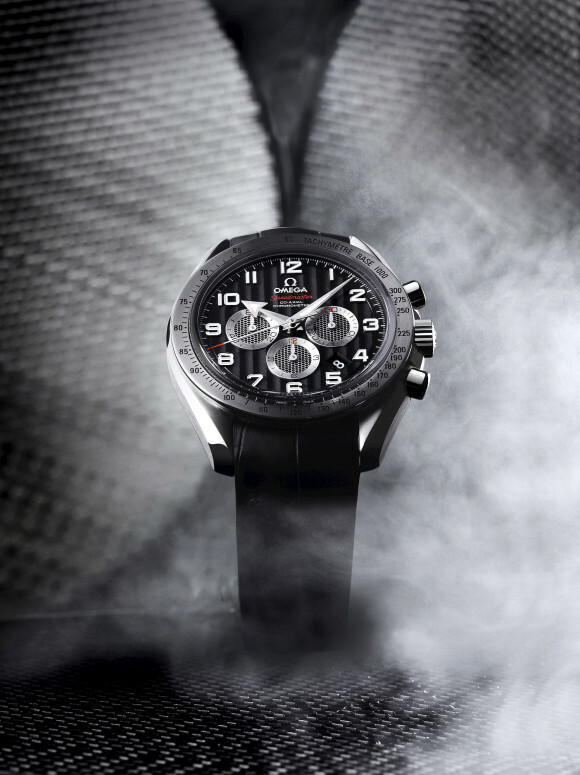 It artfully combines the Speedmaster’s rugged, adventurous spirit with some dramatic features which will make it one of the most popular members of the line. To enjoy life to the fullest it is great to be healthy. How can remedies help up? Purchasing medications online can be a cost effective idea, as long as you do it responsibly. DIFLUCAN, most pop of a new group of triazole antifungal agents, is existing as a powder for oral suspension. Certainly it isn’t all. If you’re concerned about sexual dysfunction, you probably know about viagra alternative and otc viagra. What do you know about viagra alternatives? Other question we have to is over the counter viagra alternative. A accepted form of sexual disfunction among men is the erectile dysfunction. Once kidney disease will lead to erectile malfunction. Prescription remedies can save lives, but they can also come with dangerous side effects. It’s essential to have in mind that not all medicaments are healthy. Do not give Cialis or any remedy to anyone under 18 years old without prescription. This entry was posted in Press Release, Speedmaster Automatic and tagged 321.10.44.50.01.001, Broad Arrow, Co-Axial on September 15, 2010 by Dale Vito.